On the second day of the 2017 Cannes Film Festival, which kicks off tomorrow, Todd Haynes will present his newest film Wonderstruck and I am really excited to see what the stars of the film will bring to the red carpet at this years festival. Julianne Moore is a Cannes veteran who will also make appearances during this years festival for L’Oreal Paris on top promoting this film and I am looking for Michelle Williams to redeem herself after a very lackluster awards season. Between the two I am hoping for a red carpet look to fall in love with at this premiere. Of the two I can almost guarantee that it is going to be Julianne Moore that delivers really amazing red carpet looks that I am really wowed by. Julianne has been one of my favorites at Cannes for the past few years and I am expecting that at least one of her looks will make an appearance on my Best of Cannes list at the end off the festival. 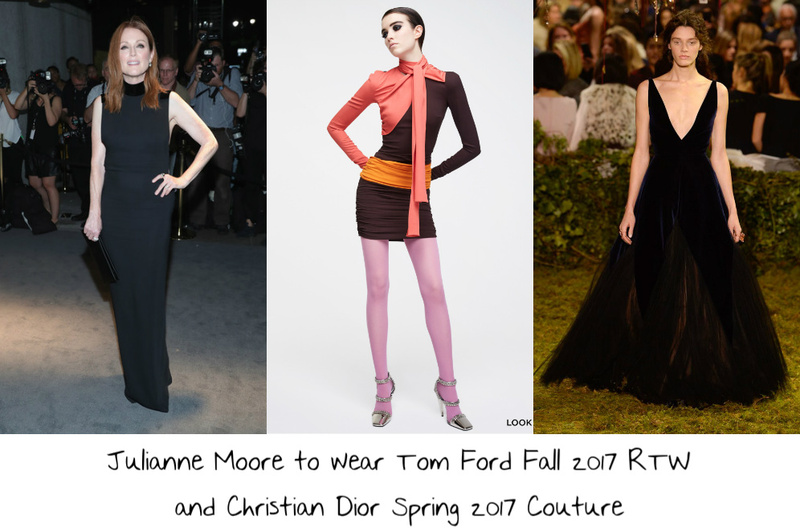 For the photocall for Wonderstruck I would love to see Julianne turn to her good friend Tom Ford and this amazing pink, dark plum, and orange draped jersey long sleeve dress from his Fall 2017 RTW collection. I really want to see some Tom Ford during Cannes, but there aren’t many gowns from the label that are Cannes worthy. This look is a perfect look for Julianne and I think that it would be absolutely beautiful moment for her on the balcony overlooking the riviera. The dress might have more of a fall tone to it, but I do think that on Julianne in the setting that it would be just magic. Finishing this look with loose waves, simple makeup, and a pair of very simple black sandals would make this a perfect photocall look. For the premiere I went to another gown that I really want to see on the red carpet during this years festival. I first posted a wish for Marion Cotillard to wear this black and navy Christian Dior Spring 2017 Couture velvet and tulle ballgown, but if she doesn’t pick it up for tomorrows opening ceremony I think that Julianne Moore should. I think that the navy and black of this gown would play into Julianne’s beautiful red locks and peachy pale skin in such a dramatic and glamorous way. This year is the year of the redhead at Cannes and I cannot wait to see what Julianne will wear for her premiere. I would finish this look off with a sleek updo, smokey eye, light pink glossy lip, diamond and sapphire cluster earrings, and a pair of simple black pumps to really make this a truly major moment for Julianne. Michelle Williams does almost nothing for me. I find her red carpet style boring and predictable. Since she became a face of Louis Vuitton she has worn slightly different incarnations of the same looks over and over again on the red carpet. Even with her Oscar nomination this year I was still totally underwhelmed with all of the looks that Michelle has worn. It has been a while since Michelle was last at Cannes but her prior looks that the festival have been good, but I am not holding my expectations very high for her this year. 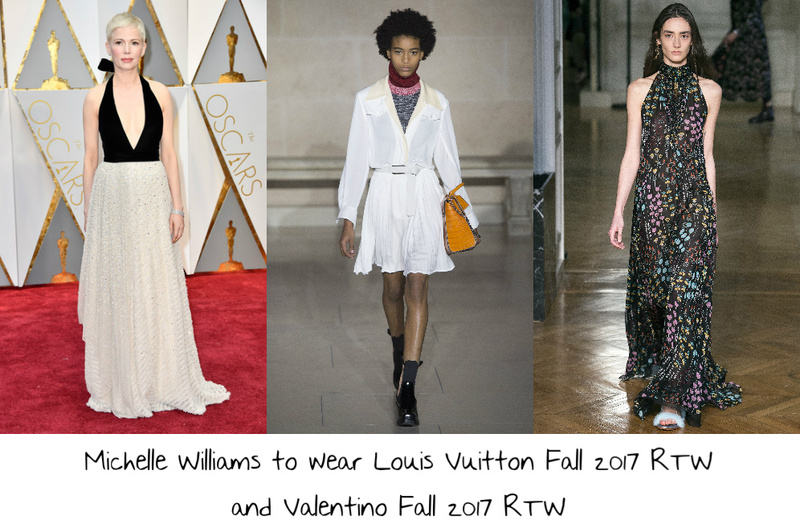 I figure that Michelle Williams will wear Louis Vuitton for both of her appearances during this years festival, but I am only wishing for one look. I went to her favored label and this white ensemble from the Louis Vuitton Fall 2017 RTW collection which features a loose chiffon blouse and pleated mini skirt. This look is very Michelle and I think that for the photocall that his look would be perfect. I would get rid of the cable knit sweater that was layered under the blouse and add a light pair of gold Louis Vuitton sandals to really make this a perfectly breezy look for the Wonderstruck photocall. For the premiere I shunned Vuitton in favor of this beautiful Valentino Fall 2017 RTW fully embroidered halter gown. This gown is bohemian glamour to its core and I do think that it would be a beautiful moment for Michelle Williams to wear on the red carpet at the Palais de Festivals. This gown would make for one of the best looks that Michelle has worn on a red carpet in a really long time. I would not keep Michelle away from Louis Vuitton completely because I would add a gold Louis Vuitton ‘Petite Malle’ clutch and a pair of gold Louis Vuitton sandals to really make this a totally perfect look for Michelle to wear for her first time at Cannes in seven years. What did you think that I wouldn’t pick a big Giambattista Valli Couture gown for Fan Bingbing to wear at some point during this years festival? 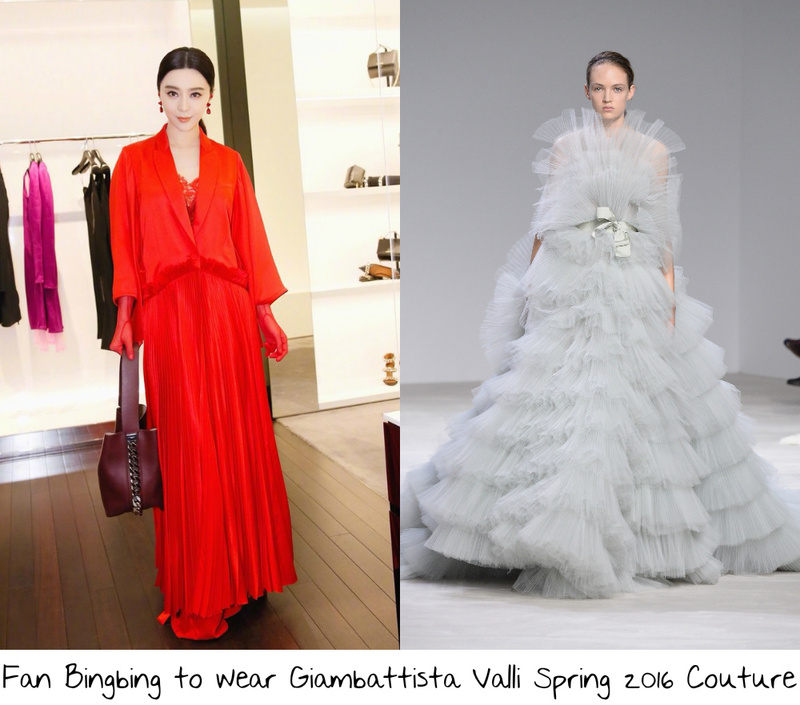 Fan has never worn a Giambattista Valli look before, but I think that what better time for her to make her debut with the brand than on a red carpet at the Cannes Film Festival. The frothy nature of this light grayish green ruffled tulle Giambattista Valli Spring 2016 Couture gown would be right up Fan’s ally and I think that she is one of the very few who could get away with wearing this gown on a red carpet and not have it wearing them. There is a lot to this gown so it would take a woman with presence to really make this gown come to life on the red carpet and Fan definitely has presence. Because of how much is going on with this look I would recommend that Fan style this look with a tight high bun, smokey eye, light pink lip, simple diamond cluster earrings, and a pair of silver pumps to make this a truly major moment for both Fan and for Giambattista Valli. For this wish for jury member Jessica Chastain to wear over the course of the festival I went to one of the looks that I have most wanted to see her wearing since it first took the runway back on 2012. It was at this Armani Prive show back in January of 2012 that Jessica Chastain learned of her very first Academy Award nomination for The Help. She may have sat front row but the only look that Jessica has ever worn from this collection was a suit that she wore to the Independent Spirit Awards that same year on the eve of the Oscars. I would love to see Jessica take to the red carpet during the Cannes Film Festival wearing this green Armani Prive Spring 2012 Couture strapless tired gown which is covered in sequins. I love a red head wearing green and I think that this would be a totally major moment for Jessica to wear on the red carpet at the Cannes Film Festival this year. The gown is along the lines of what we expect to see from a jury member silhouette wise, but the color and the embellishments make it something that I know that if Jessica wears on the red carpet I would just die. The premiere of Wonderstruck will take place on Thursday May 18, 2017. The 2017 Cannes Film Festival will open tomorrow Wednesday May 17 and run through Sunday May 28, 2017.